Do you know how hard it is to get someone to commit to a multiday hiking trip with you? Here’s a challenge. Try to get someone to even commit to a dayhike with you. Its impossible. I had four strong maybes for this trip and one committed Yes. They all ultimately bailed. And that’s why I usually hike alone. To be honest I’ve been getting really weary of traveling alone. When I go out my husband stays home with the kids, nor is he necessarily interested in doing what I do. Unless I can rope a friend into taking a week off work, driving all day to a remote location, then suffering for several days hiking in the hot desert sun, it is usually me, myself and I. It gets boring, stressful, and lonely. And then when I get back I have nobody to talk to about what I’ve done because nobody else can really understand the moments as they were in their context. I’ve been aching for a parter to share these intense experiences with. Its been a longing and a sadness, but this trip, all that changed in a big way. This year started out really cruddy. My fathers health was failing, a good friend passed away unexpectedly, another friendship ended suddenly, and a project I’d been working on for two years died. All this culminated in a moment of melodramatic self pity when I posted this to Facebook, “The day you stop believing in magic.” I know. Laugh and snort at me. I deserve it. But from that moment forward things miraculously started to change in unexpected ways. First, I met a stranger in the wilderness who had such profound things to say to me that it forced a paradigm shift in my entire world view and how I approach my life and personal growth. (Recently I returned to that spot where it happened and it was shocking to be in the exact same place and feel like a totally different person. I felt like a person cracked in two and it took me several minutes to regain my composure.) Since that magical encounter in the Spring, every time I’ve traveled alone I’ve continued to have meaningful coincidences with energetically powerful people who have each given me bits of wisdom to help me along my new path. My friend Sama told me it is not just me, it is a principle that solo travelers recieve magical help. 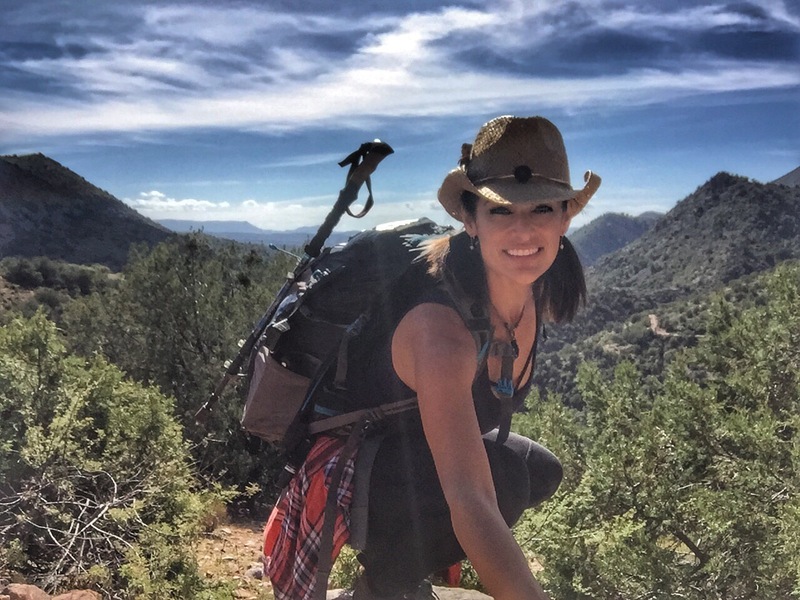 I would argue that any traveler, solo or not, who is receptive will have amazingly coincidental helpers appear for them (see this post Trail Angels & A Big Ol’ Slot), but perhaps solo travelers are less distracted from their experience so they notice more. 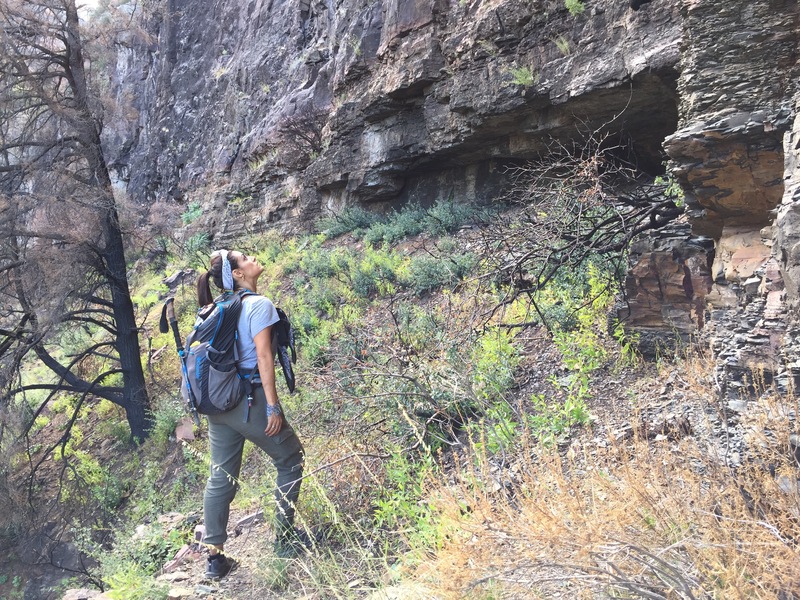 So when it turned out that I’d be making this trip to the Sierra Ancha Wilderness of Arizona to look for 13th century cliff dwellings alone (again! ), I decided to look forward to spending five days in quiet meditation. I made it a spirit quest of sorts. I was there to learn to love being alone and was eager to see what magic may await me, the solo traveler. 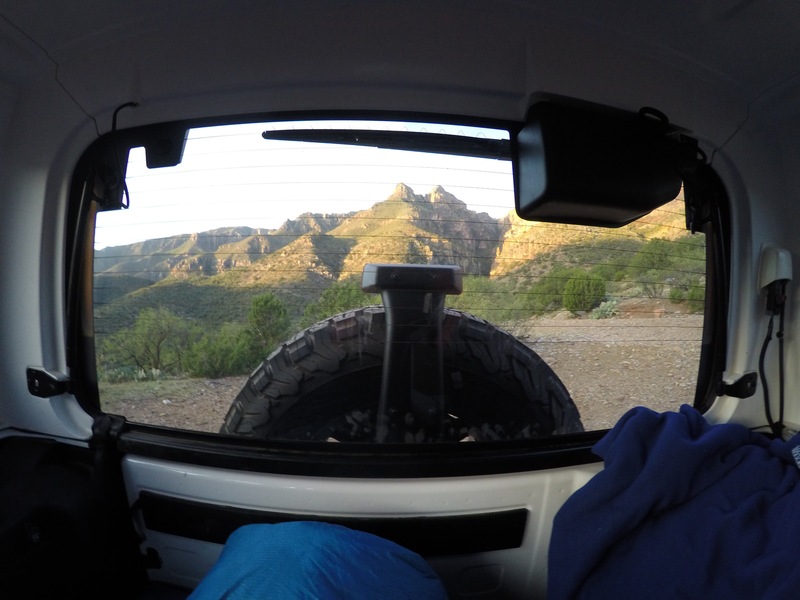 I do love sleeping alone in my jeep. I imagine I’m in one of those Japanese hotels where you get a personal cubby hole or a drawer to sleep in. Its safe and warm and, unlike a drawer, has a fantastic view. Before falling asleep I deferred to morning the decision to either spend the next day looking for Ancha/Salado cliff dwellings in Pueblo Canyon or Cooper Forks Canyon. I was all cozy in my sleeping bag as dawn arose. I was in that twilight haze just before you wake up when you know you should probably get up and get your day started, but you’re so comfy you keep excusing yourself to go back to sleep. In my mind’s eye, as clear as if I’d been sitting up drinking coffee, I saw a man walk past the back of my jeep wearing a backpack. He looked at me and said, “There’s a golden goose.” Then he pointed to Cooper Forks Canyon. He then walked on down Cherry Creek Road as if to leave the wilderness. Cooper Forks Cliff Dwelling across Cherry Creek Canyon from my jeep on the opposite side. There are many things that are significant about this. There are some ideas that I cling to and call my “golden eggs”. But being too attached to things keeps you stuck in the past and I’ve been seeking ways to honor wonderful outworn ideas without letting them hold me back. So imagine being simply told that the treasure you have been jealously guarding isn’t really the most precious thing afterall. In fact, it has a source that can make lots more of these treasures. And presumably, that source is meant for you. AND that source is waiting for you over in Cooper Forks Canyon! Bonus! The other thing that was significant about this message and this messenger was that I recognized the man. There’s something that happened to me that I’ve always told as a ghost story. When I was about five years old, I got up in the middle of the night to use the bathroom. When I stepped out into the hall there was a tall, strong, intense American indian man standing in the hall staring at me. I was so freaked out I just quietly turned away from him and went into the bathroom, hoping he would just not be there when I came back out. (This is how I deal with sudden intensely stressful situations, batten down the hatches, watch and wait for more information.) When I came out he was gone. Whew! I didn’t tell anyone about that for years. Following this event, my mom, whose side of the bed looked out onto the same hallway, would wake up once every couple of months screaming that she thought man was about to come into my parents’ bedroom. Later in life I put it together that we had both perceived the same man and that he really must have been in the hall. The only difference between my mom and I was that I’d actually seen his face, she just knew he was out there. I saw him again in the Sierra Ancha for the first time since I was five years old and this time he told me something personal and meaningful. I realized that he must be my spirit guide. I was so excited. I’d come to the wilderness alone and boy was I alone, probably the only human roaming the wilderness in an area the size of Yosemite Valley. I’d come to embrace solitude and enlightenment and wondered if maybe I would meet someone nice. I ended up meeting the best person possible. Talk about meeting soulmates in the wilderness! Well, naturally there was no further question about whether I would go up Pueblo Canyon or Cooper Forks that day. Cooper Forks it would be and I would try to figure out what the golden goose could be. Was it actually something I would find in the pueblo ruins? Was he trying to tell me someone in my life, like my husband, was my golden goose? I asked for this answer to be revealed in my day’s travel. Descending Cold Creek Canyon was a job. First order of business was to boulder hop down the west mountain through Cold Creek Canyon to the canyon bottom at Cherry Creek which was running strong. What’s visible of Cooper Forks cliff dwelling until you are right on top of it. From that point forward there was no good news. First I climbed up a sandy slope. Then I climbed up a rocky scree slope. Then I climbed up a boulder field. Then another scree slope. And it was not like it was smooth sailing. Cats claw shrubs grabbed at me constantly. I argued with a lot of juniper trees that wanted to grow close to the ground and make me crawl under their branches. On the rocky scree, for every one foot forward I slid six inches back. I fell a LOT. Falling down was the norm and an accepted part of this approach, but the game was just not to fall into a cactus. Slippery rocky scree with cactus obstacles. The cliff dwelling in the yellow distance. I was hot, cranky, hungry, and tired. With every step I repeated to myself, “You can do it.” I stopped to admire a tall flowering cactus and noticed that someone else had built a little house in an inaccessible, defensible high perch. It held a bird’s nest. The nest was an empty swirl of dry grass with a few tiny, downy feathers lining it’s floor. Bird’s nest in a cactus. When I reached a parallel altitude with the cliff dwelling I had to make a decision. Cross over to the cliff dwelling first or look for the pueblo that was also supposed to be near me but in the opposite direction. Since going to the cliff required crossing a field of scree, I opted to try to find the pueblo, rest and have lunch there. I looked and looked and looked for it. I was so frustrated because I had a GPS waypoint saying it was at this same elevation, but just a few hundred feet away. However a few hundred feet away was down the cliff. Then I realized something I hadn’t thought of. The pueblo would be at the same elevation, but on the butte in front of me. I would have to go down the slope then somehow ascend that butte to get to the pueblo ruins. Ugh! So tired. But what was I there to do after all? I soldiered on. Butte hosting a pueblo ruin on top. More junipers, manzanitas, agave and cats claws to negotiate, and then the ruin. Pueblo ruin on the butte. The ruins of this pueblo were peculiar because there wasn’t even a spec of mortar anywhere. I counted six rooms and every wall was just a stack of stones constructed to look exactly like the rock the building was perched on. I wonder if 700 years of exposure just washed away any mud that would have stuck these rock together. I would have expected to see at least a tiny remnant of mortar somewhere, but no. Exhausted, I huddled inelegantly in the corner of one of the rooms facing a wall and devoured my lunch. I thought some more about the “golden goose”. What could it be? Whatever it was it took a lot of hard work, determination and fortitude to discover. Fortified with a few calories I took a deep breath, hoisted my pack and trudged forth determined to tackle the crossing of the scree slope over to the cliff dwelling which I was excited to see. Finally, I was standing below the cliff dwelling! A short vertical climb lead to the front door of the first room I saw, but the compound had more segments around the most obvious cliff face that were more easily accessible. The first was a small foyer that looks like it would have housed a ladder leading up to a cave passthrough leading to an upper room — the room that is only accessible from the outside by cliff climbing. Now, instead of a ladder, a curvy juniper log leans against the wall. Was that always the ladder? Entrance foyer with juniper log ladder. The upper room accessible by cliff climb or cave passthrough. This room is visible from the valley. Unlike at Devil’s Chasm the ground floor rooms of this cliff dwelling had storage bins at the back, narrow compartmentalized rooms like bricked in closets. Storage bins at the back of a room. There were many artifacts lying around at this dwelling. The best one for me was what I consider to be a holy grail of artifact finds, ancient corn cob. The one dried corn cob I saw was only about three inches long. 700 years ago somebody chewed on this ear of corn. I guess they either grew it on the rocky mesa above the cliff dwelling or traded for it down canyon from a larger farm that was thought to be where Ellison Ranch is now, near the southern mouth of Cherry Creek Canyon. Another pretty impressive artifact there was a sherd of painted pottery. One room had a metate and mano sitting in it just waiting for someone to come home and start preparing meal. No big deal. Stones can wait 600 years. There are 15 rooms in this complex and what was most impressive about them is that there are several more or less intact ceilings so you can clearly see how they were constructed. First are the support beams, then the smaller cross beams, then sticks and grasses, then flat rocks, then mud/mortar to make the smooth upstairs floor. Inside the two-story room with the fallen ceiling/upstairs floor. Two story room. Ground floor storage bins are slightly visible behind the wall to the right. I loved the cliff dwelling at Cooper Forks. It felt very homey. It was much more hospitable as a living place than the ruin at Devil’s Chasm I’d visited the day before. There was some outdoor space for people to roam and the mesas on top of the mountain seemed wide and reasonably accessible. I did wonder where the water source had been. It seemed too far of a climb to fetch the water daily from the bottom of Cooper Forks Canyon, although not impossible. I would have liked to traverse up to the green mesa tops and see if it may have been dry farmed and look for other past sources of water, but it was very late. As it was I would barely make it back to camp by dark and I still had to tackle the boulder scramble back up Cold Creek Canyon. View of the possibly arable mesa tops from Cooper Forks cliff dwelling. I sat in the tiny doorway of one of the high rooms and looked out over Cherry Creek Canyon thinking about the hard hike that still lay ahead of me this late in the day. I knew that I could do it, all I had to do was start. The beauty of the Sierra Ancha mountains swelled in my eyes and heart. I felt so grateful to have been able to bring myself to this place and experience so much beauty and history through the conveyance of my own body. I felt like a prism projecting colorful light, like I had placed the idea inside myself that I wanted to see this part of American history, and through my own efforts a full spectrum experience was born. It then became clear to me what is the golden goose. I am the golden goose. There is no need for me to hoard any past experiences or ideas I’ve created in my life because they all come from me. I can imagine them, initiate them and make them my reality. I am full of infinite possibility. My golden eggs aren’t given to me by anyone and they are not in short supply. I am the creator. I am the source. I can make as many golden eggs as I want. Forever. It is wonderful to have partners to share beautiful experiences with. Love in all its forms should be shared, but I know now why I feel so loved, protected and lucky when I go on solo adventures. I’m never truly alone. My spirit guide is always with me, tells me what I need to know when I need to know it, and brings people to me when its appropriate. I love the idea that he’s introduced himself as my hiking partner. He seems like a no nonsense guy, pretty intense, and definitely tough. That’s good because tomorrow, even though I’m exhausted, we’re going up Pueblo Canyon to see more treasure lying in the folds of the Sierra Ancha Wilderness. No slackers allowed. We’re off to turn some more nascent ideas into precious golden eggs. I’m loving following your adventures and personal growth. Are you thinking about a book with some of this? Keep the goodness coming. I must say I really enjoyed reading this on several levels. I have been trying or wanting to reconnect with my spirit animal somewhere somehow that I’ve felt before, but have been missing. As a semi-retired person, I often hike or adventure alone, and sometimes find it takes a lot of effort. But the rewards can be great. Funny, I also belong to a hiking group, and enjoy the social part, but it’s different. I used to live in Phoenix, and I’ve been in that very general area, but never explored it anywhere like you have. Maybe because FT work. But I really appreciate all your thoughts here. It’s been two years since I had to put my 14 year old lab down, and she was the best hiking buddy. Thank you much. Very timely for me. Loved the descriptions and photos of the ruins. That’s quite a architectural find. I too am mostly a solo hiker and backpacker. I’d love to find a compatible and available partner but this far it hasn’t happened. For me is say the time’s not right. I tend to take second seat, behind second fiddle when I’m with a partner. I’m happy to compromise, or at least I think at the time I am. Solo travel forces lots of decisions. I love the flexibility, the spontaneity, the freedom to live in the now. I’m much happier living on the road than in my home. Cheers to adventure!